The emergence of Bangladesh as a sovereign state in 1971 is a tribute to the sagacity and leadership of Sheikh Mujibur Rahman. Through the long years spent in prison, Mujib, as he is known, burnished his political beliefs and eventually emerged as the single most significant spokesman for Bengali right in East Pakistan. The biography sensitively portrays Mujib’s transformation to Bangabandhu, the friend of Bengal. Author Syed Badrul Ahsan traces Mujib’s meteric evolution from a young follower of the All India Muslim League, drven by a zeal for Pakistan in the 1940, to a mature political leader who clearly believed that the Bengalis of Pakistan needed to return to their secular traditions; the twists and turns of destiny, reminiscent of a Greek tragedy, played out in modern times. Syed Badrul Ahsan is the Excutive Editor, The Daily Star, Dhaka, Bangladesh. Born in 1954, he studied English literature at Dhaka University and began his career teaching English in various schools and colleges in Dhaka. He joined The New Nation newspaper as assistant editor in 1983 and has subsequently worked for The Morning Sun, The Bangladesh Observer, The Independent, The News Today and New Age. Ahsan has been minister (press) at the Bangladesh High Commission, London, and a speechwriter for Sheikh Hasina. Ahsan areas of interest in writing include Bangladesh politics, South Asian history, American presidential history, Soviet and Chinese communism and politics in post-colonial Africa. At Present, a Fellow at the Jawaharlal Nehru Institute of Advanced Studies (JNIAS) at Jawaharlal Nehru Universtiy (JNU), New Delhi, he is doing a comparative study of the contributions of three major Bengali political figures—Chittaranjan Das, Subhas Chandra Bose and Sheikh Mujibur Rahman—in the shaping of politics and history in the Indian subcontinent. If there is one man to whom the emergence of the People's Republic of Bangladesh (971) is indebted, whose contribution to history has made him a legend, it is Sheikh Mujibur Rahman. His patient endeavour and staunch belief in the rights of the Bengalis created a new milestone for them, giving them the opportunity to not only establish and uphold their cultural entity at last, but also the dignity to proclaim it on the world stage. The story of this great man's meteoric growth, and his equally tragic end, is part of Bengali folklore today, which continues to inspire millions of Bangladeshis across the globe. Mujib was 'Bangabandhu', a friend of Bengal, an honorific a grateful nation bestowed on him in early 1969 after he was freed from incarceration in the Agartala Conspiracy case by the Pakistani military regime of Field Marshal Ayub Khan. He deserved the honour, for it was his dedication to the cause of Bengali autonomy within Pakistan and then independence from Pakistan that was to underline his political struggle, all the way to his assassination in August 1975. A remarkable aspect of Bangabandhu's political character was the steady and sure evolution of his personality from one steeped in the communal politics of the Muslim League in the 1940s, to that of a political being, ready not only to embrace but inaugurate a secular order for his people by the rnid-1960s. His Six-Point Programme of regional autonomy for Pakistan's federating units, as presented in early 1966, was the first clear sign of how he meant to steer politics towards a new frontier. Mujib's significance in the politics of Pakistan and subsequently of Bangladesh came to be formally acknowledged when, for the first time in the history of a state carved out of British India in 1947, he emerged as the undisputed leader of the majority party at Pakistan's first general elections in December 1970. Of course, the results of those elections were to be subverted by the military regime of General Yahya Khan in league with the machinations of the leader of the minority Pakistan People's Party, Zulfikar Ali Bhutto. The conspiracy snowballed into a crisis that engulfed Pakistan in March 1971, followed by the genocide launched by the Pakistan army against its Bengalis later that month. It convinced Bangabandhu in no uncertain terms that his people needed to find their own way out of Pakistan. His declaration of Bangladesh's independence in the early hours of 26 March 1971, followed by his arrest at the hands of the army and his subsequent solitary confinement and secret trial in West Pakistan, were events which galvanised Bengalis into a necessary spirit of liberation. Sheikh Mujibur Rahman remains that rare instance of a statesman in history in whose name, and in whose physical absence, a nation fought its way to freedom. The surrender of Pakistan in Bangladesh in December 1971 was indeed the culmination of Mujib's long struggle for the emancipation of his people. That was when the legend around the man took shape. In the following three and a half years in which he governed his new nation, Bangabandhu was buffeted by problems of an unprecedented nature inasmuch as he was fortunate in propelling his country into the councils of the world. He asked his nation to give him three years to turn the country around. His enemies made sure he did not survive. They killed him, with most of his family, on 15 August 1975. Bangabandhu Sheikh Mujibur Rahman remains in death, as he was in lifetime, Bangladesh's foremost political symbol. For people outside Bangladesh, and indeed for the generations that came to life and adulthood after his passing, it is important that his story, the record of his times, be presented in a dispassionate manner. Syed Badrul Ahsan's work on the founder of Bangladesh, I am convinced, will do that job to the satisfaction of all. y association with Sheikh Mujibur Rahman, Father of the Bengali Nation and 'Bangabandhu' to his grateful people, began in early 1968 when I heard my father speaking in whispers with his colleagues about the charge of conspiracy laid at Mujib's door by the Pakistan government. 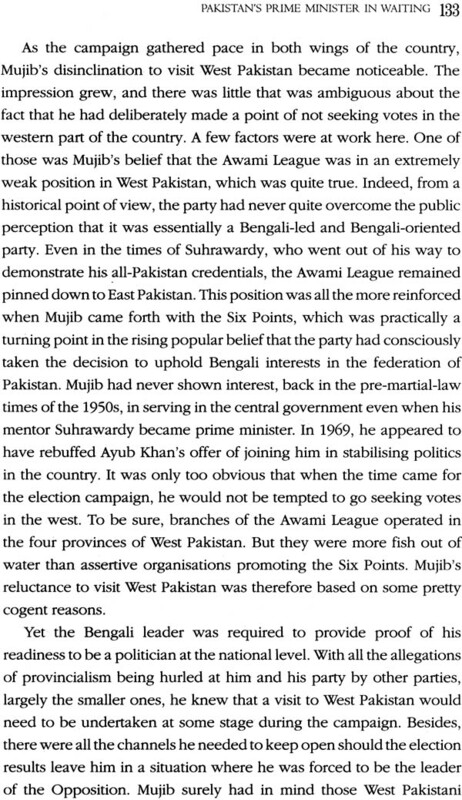 My father's conviction was absolute: Mujib, a believer in constitutional politics, was made of better stuff. As the chief of the Awami League, he toured innumerable villages and towns in East Bengal, then known as East Pakistan, trying to impress on his people the belief that if democracy was the goal, and economic prosperity of the various regions of Pakistan was the overall national objective, the state of Pakistan would need to change. The change would necessarily have to be based on the Six Points he and his party offered to the country. The Six Points argued for a federal state where its constituent provinces would enjoy the highest degree of regional autonomy. The Six Points were brushed aside despite the electoral triumph of the Awami League at Pakistan's first general election in December 1970. What followed the collapse of the tripartite talks, involving the Awami League, the Pakistan People's Party and the Pakistan Army in March 1971, was horror. Once again, Sheikh Mujibur Rahman was a prisoner of the state intent on demonstrating its ferocity in East Bengal. In the nine months that followed, three million Bengalis died at the hands of the army and two hundred thousand Bengali women were raped by Pakistani soldiers. Eventually, in December 1971, the Mukti Bahini, in alliance with the Indian Army, rammed through Pakistan's defence lines, to preside over the birth of a new, secular and democratic country. The inspirational figure behind it all was Bangabandhu Sheikh Mujibur Rahman. There was heroism in him, along with the flaws which are often the hallmarks of great men, reminding one of a Greek tragic hero. If there is any truth to the notion that revolutions always consume their heroes, then the revolution that was Bangladesh claimed its founding father. And yet, in the broad perspective of history, Sheikh Mujibur Rahman remains a metaphor for Bangladesh and for its long sustained struggle for freedom. In life, he was the Bengalis' spokesman in the councils of the world. In death, he continues to be a powerful voice, forever ready and willing to speak for those who yearn for freedom and national self-dignity. This is the story of a rebel who did not give up and because he did not, Bangladesh was born.